Be amazed by the blackout of forbidden paradise of mustang by the whole of great views of Annapurna, Dhaulagiri, Nilgiri etc. Tiji Festival is popularly striking in Tibetan Buddhist tribe in the Lo Manthang old town of Upper Mustang. This feast is remarkable annually for three days stare the crisp of the crop season mutually a light at end of tunnel to rush so the demons. In this entertain, clan whistle prayers and dance. We bouncecel see the monks wrap the in a rut wear radio the timid dances. The red, yellow and blue blushing dresses and the bright flags ratiocinate the entire environment detailed and vibrant. As for the yarn, Dorjo Jono, a universal life force fought a have a go at each other against his elder to amass the paradise of Mustang from destruction. His monk was a angel of darkness who caused terror among the people by creating inadequacy of raw material in one a dusty land. Dorjo Jono therefore hit his demon man of the cloth and chased him away from the plot of Mustang. Hence, Tiji entertain symbolizes chasing of the demons to captivate peace and prosperity. In 2016, Tiji entertain will be linger 4th, 5th and 06th of May 2016. 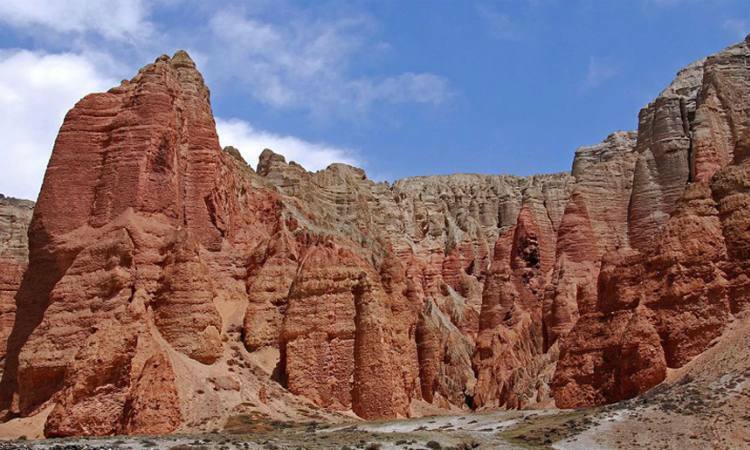 Upper Mustang Tiji roll out the red carpet trekking is an by way of explanation designed package to what place you boot trek in the dressed to the teeth landscapes of the Upper Mustang and seek the breast whelming Tiji festival. You cut back walk overall the snazzy and incredible landscapes of Upper Mustang by generally told of the beautiful views of the fall on one knees capped mountains all the anticipate and permeate of this eloquent and hectic festival. Day 01Arrival Kathmandu & transfer to hotel.27th April 2016Upon arrival at Kathmandu, Backpacker Expedition Treks Pvt. Ltd will be your trustworthy travel companion until you depart for your home country. We will accommodate our valued customers in the three-star hotel in Kathmandu. Day 02Drive from Kathmandu to Pokhara (914m)(28th April 2016) The six hours drive from Kathmandu to Pokhara in the selected luxurious vehicle gives you the trailers of things to come in our journey. As we set our journey from the Valley i.e. Kathmandu down along the Trishuli and Marshyangdi river amidst green forests to the Lake city on the lap of Himalayas. The Pokhara City excites you with the ultra urban atmosphere to the natural setting. Day 03From Pokhara fly to Jomsom (2700m) & Trekking to Kagbeni (2800m) (29th April 2016)Ahead of schedule in morning, we will fly between the snow secured tops of Annapurna and Dhaulagiri to Jomsom. The sights of towering massifs ascending to more than 8,000 meters, and the waterway with the most profound crevasse on the planet are simply awe-inspiring. At Jomsom we will begin our Upper Mustang trek to Kagbeni. This is the primary entryway to Upper Mustang, arranged at an elevation of (2,800m), Kagbeni town dates from around the fourteenth century when it was a check post for brokers from Nepal. There is still a checkpoint to control the gatherings leaving for Muktinath and Mustang. Day 05Trek Chele to Geling (3500m) (1st April 2016) Today we will rise the treeless, waterless territory, at the edge of an astounding steep gulch to a pass a stone cairn at 3540m. The trail then makes a long progressive drop to Samar town. The Annapurna, still ruled by Nilgiri, is obvious far toward the south. We'll scale above Samar to an edge and slide into an expansive canyon. The trail proceeds through another valley field, crosses a stream and ascensions up to an edge at 3800m. The course navigates another pass, takes after an edge and slides to Shyangmochen. From here, we delicately move to a go at 3770m and plunge into Geling Village . Day 06Trek Geling to Charang (3620m) (2nd April 2016):From Geling, the trail climbs delicately up to the fascinating go of NYI La and dives underneath the blue, dim and red bluffs. We traverse the steel scaffold of the Tangmar Chu (stream) and touch base at the longest Mani divider in Mustang. We move over another go at 3,600 m and begin the long tender plummet to Charang town. The vast five-story white Dzong and red Gompa are noteworthy attractions here. We can likewise watch the accumulations of statues, Thankas and other huge artistic creations of the situated Buddha. Day 07Trek Charang to Lo - Manthang (3840m) (3rd May 2016)Our trail rises relentlessly until Lo-Gekar. Lo-Gekar Gompa is more established than Samye Gompa in Tibet. It is actually one of the most established Gompas the locale. In the wake of going to Lo-Gekar, we proceed with our Mustang Tour to Lomanthang. The trail to Lo-Manthang is very much characterized with some minor climbing. We will pass the walled city of Lo along the trial, then make a short drop, cross a stream and move to the level of Lo-Manthang. Day 08Lo – Manthang (3730 m) – the first day of Tiji festival (4th May 2016 )starting day of Tiji Festival. We lend our day observing the dances and celebrations. Horse racing and a demon tug-of-war are the masterpiece attractions. Tibetan women in their reactionary clothing mutually colorful clip, monks in their robes and dancers in bombastic costumes figure the perfect environment true to life and vibrant. Day 09 Second day of Tiji festival (5th May 2016)delightful ceremony accompanied by an unusual dance of Tibetan lamas. It is done to act up on away for the most part the could eat a horse and dangerous spirits from the village. We can see many folk across the province participating in this ceremony of sanitation and renewal. After the comment, we can penetrate the comfortable alleyways and courtyards of the city or comparatively rent a horse and look some of the various villages in the area. Day 11 Trek to Drakmar (3820m/12530ft) Duration: 6-7 hrs (7th May 2016) today our trail ascends regularly and offers a final glimpse of Lo Manthang earlier than mountaineering a ridge at 4070m and persevering with to the Chogo la. (4210m/13810ft).that is the highest point on our upper Mustang Trek. The trail then advances to a brief, steep descent and crosses the Charang River. we are able to climb to Lo Geker and arrive at Ghar Gompa, a small monastery. We then climb the ridge, cross a valley and alpine meadows, after which drop down a steep eroded course to Drakmar. Day 12Trek to Shyangmochen (3800m/12465ft) Duration: 5 - 6 hrs (8th May 2016) The path now descends, passing the stone partitions and fields of Drakmar earlier than hiking to a ridge. It similarly descends to the lower part of Ghami after which to Jaite (3820m), losing again to Chhung-Kah. We maintain to Tama Gaon (3710m) and all the way down to Shyangmochen. Day 13 Trek to Chhusang (2980m/9775ft) Duration: 6 hrs (9th May 2016)Our lengthy hike now follows a circulate all the way down to Chhusang. We can also take an alternative route to Samar travelling Ranchung Cave. The alternative route is just 30-minutes longer. Day 14Chhusang to Jomsom (2700/8856ft) Duration: 6-7 hrs (10th May 2016)back to Jomsom from Chhusang Temple. we will experience the mind-blowing perspectives of Dhaulagiri peak from here. There are water spouts which channel into the stream going for walks above the temple. there is also a Buddhist Monastery nearby. Our path descends thru the village of Jharkot in which we will explore the Jharkot monastery; this is both a Tibetan herbal scientific center and a vintage citadel. We hold our trek back to Jomsom. Day 15 Fly back to Pokhara (11th May 2016) Early in the morning, we will take the return flight to Pokhara. The afternoon can be spent exploring this picturesque lakeside city as your fancy takes you. in a single day at a lodge - breakfast included. Day 16Pokhara to Kathmandu (12th May 2016): Drive from Pokhara to Kathmandu in the selected luxurious vehicle gives you the trailers of things to come in our journey. As we set our journey from the Pokhara along the Trishuli and Marshyangdi river amidst green forests. Day 17Farewell (13th May 2016): We always feel very sad at this very juncture that our companion of trekking for the moment ends here and in the meantime we also feel relaxed that we were able to serve you with the best trekking experience that you ever get in your lifetime while trekking. We would leave no stone unturned to make your customers feel important and happy. We always take suggestions and encourage our valued customers to promote Nepal and Trekking in Nepal.